A healthy environment starts at home. More than ever, we’re aware of how our buying choices affect the health of our planet and our families. There’s no such thing as a perfect eco-friendly fabric, but when you’re looking for the perfect fabric, environmental friendliness is one more thing to take into account. Truly conscious consumption takes time and research, but Phifer has created this guide to help you get started. What Makes Phifer Fabrics Eco-Friendly? When you think about eco friendly fibers, a few natural materials such as hemp, linen or cotton are probably the first to come to mind. While there are some wonderful natural fibers out there that can certainly qualify as environmentally- friendly, if you are looking for a natural fiber that’s truly good for the earth, you’ll need to look deeper: Is this fabric certified organic? Is it fair trade? Intensive farming practices, pesticides, water use, dangerous work environments and other realities of large-scale fiber production can end up tipping the scales back the other way. 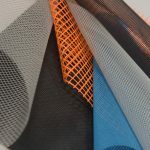 On the other side of the spectrum, many synthetic fibers begin life as petroleum-derived polymers, or plastics, which can raise some environmental eyebrows. The truth is, just like with natural fibers, the way these fibers and fabrics are produced and the resources required to make and maintain them makes a huge difference in how much they impact the environment. Each type of fiber has a long list of pros and cons, which each consumer needs to take into consideration. The way a fabric is made has a huge impact on how green it can be considered. For example, Phifer’s GeoBella® line of high performance designer fabrics is made of 100% olefin. The manufacturing process for olefin fabric like GeoBella​ is also eco-conscious, with very little waste created during production. GeoBella​ is available in a spectacular range of colors, weaves and patterns, and the yarn is solution-dyed, which is better for the environment in several ways. Adding the color in before the fabric is woven means that the issues of dye runoff and chemical color fixatives, which plague other types of fabric, are completely eliminated. Pollution isn’t just a factory problem. Many of the products we live with and use in our everyday lives are constantly releasing a stream of chemicals into the air. These chemicals, known as Volatile Organic Compounds or VOCs, are associated with health problems such as respiratory illnesses and headaches. Furnishings and fabrics are some of the worst offenders. To help combat the issues caused by chemical off-gassing, all of Phifer’s fabrics, including GeoBella​ and Phifertex®, hold GREENGUARD® Gold Certifications. 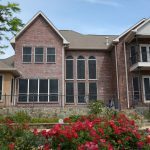 The GREENGUARD​ Certification program was created to tackle this problem, with stringent standards for low VOC emissions. Fabrics that are GREENGUARD​ Certified have gone through intense lab testing and are scientifically proven to have low emissions. That’s great news for air quality -- indoors and out. In the USA, around ten million tons of textiles end up in landfills every year. If these fabrics are natural and biodegradable, they end up releasing greenhouse gases as they break down. If they’re synthetic, they just sit there for centuries. Less than three million tons of fabric are recycled annually, but the number is climbing. That’s why we’re so proud that GeoBella​ is 100% recyclable. The olefin fibers from GeoBella​ can be re-extruded into new yarn up to ten times without any loss of quality, while using fewer resources (energy, raw materials, chemicals) than the production of virgin fabric. Plasticizers give vinyls their pliability, or unique ability to bend and flex without cracking, breaking or holding memory. They are a key component in vinyl-coated polyester yarn used in our Phifertex​ fabrics, giving it the flexibility to be sat on repeatedly without losing its shape. DOW ECOLIBRIUM™ Bio-Based Plasticizers offer a renewable, plant-based composition. These compounds provide a lower carbon footprint, can be recycled in a standard vinyl stream, and also reduce greenhouse gases by 40% versus traditional petroleum-based plasticizers. Phifertex​ fabrics can be constructed with DOW ECOLIBRIUM​ plasticizers for an eco-friendly option. This unique green technology can be added to any vinyl-coated polyester product on a custom basis only. When it comes to choosing eco-friendly upholstery fabric for outdoor use, there are other considerations to keep in mind. Natural fibers often have more difficulty standing up to the stress and strain of outdoor living: the weather, the muddy paws, the inevitable ketchup or wine spills. Mold, mildew and sun damage can considerably shorten a fabric’s lifespan. In many cases, it may be more eco-friendly to choose a sturdy, easy-to-clean synthetic fiber that will last longer instead of ending up in a landfill after a summer or two. One such option is Phifer’s GeoBella​ line of Designed Fabrics. GeoBella​ is a durable and long-lasting fabric that is UV/fade resistant, water resistant, and easy to maintain, so it will stay looking great whatever the weather throws at it. 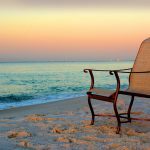 Choosing a truly durable fabric is an often overlooked way to cut down on the environmental impact of your outdoor furniture, but it’s an important one, and it may be the factor most in your control. 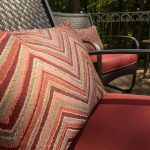 You might expect to pay a little more for a high-quality outdoor upholstery fabric, but when you divide that extra cost over the longer lifetime of the material, it often turns out that you’re saving both money and the environment. ​Now that you’ve done a bit of homework learning about environmentally-sustainable fabric, why not have a little fun? 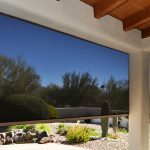 With the Phifer Outdoor Fabric Visualizer you can explore all the DIY possibilities. Use our sample images to combine and compare colors, patterns and textures and preview how they might look in your home.